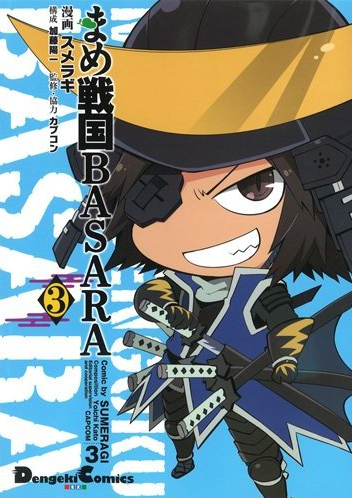 The third volume of Sumeragi's Mame Sengoku Basara 3 ('Bean Sengoku Basara 3') manga was released on 27th March 2013 by ASCII Media Works. The specification is the same as before with 126 pages for ¥780, however this time there are only eight chapters rather than the usual ten. It's available online from import stores such as Yesasia, Amazon Japan or CD Japan. The setting then completely changes and has Yukimura visiting Hirotsuna with Sasuke and Mitsunari in tow. He's hoping that Hirotsuna will be able to teach him how to work with tigers. The two hit it off, but will Yukimura actually succeed in his quest? After that, things move to the Setouchi area where Motonari is trying to persuade Motochika that Ieyasu is responsible for his latest misfortune. When an unexpected interloper ruins everything, the pair head off to bother Kanbee instead. My favourite chapter in this volume is next. It's the new year and Yukimura decides to visit a special shrine to wish for Oyakata-sama's recovery. To his surprise Masamune is there too, so they both race to be first to the goal while Yukimura wonders what Masamune plans to wish for. The dialogue is genuinely sweet, especially because Masamune and Yukimura are able to spend some time together with less angst than usual. The next story is set in February, with the traditional bean-throwing ritual at setsubun proving to be an unmissable opportunity for a bean-themed 'Mame' Sengoku Basara adventure. Motochika heads out to play the part of the oni, allowing villagers to pelt him with beans and revelling in his role. It's not long before Motonari, Ieyasu and Kingo arrive to disrupt his fun. The seasonal festivities continue into the next chapter with a tale about Tsuruhime calling the other female characters together to celebrate the Doll's Festival (hinamatsuri). This is followed by a retelling of Kojuurou's trek back from Odawara with a defeated Masamune as depicted in Sengoku Basara 3 Utage. Hisahide confronts the retreating army, indulging his appetite for harassment at the expense of poor Kojuurou. This festive volume of Mame Sengoku Basara was just as delightful as the two which came before. It's currently the most recent of the three compiled Mame Sengoku Basara books; the fourth will be released on 27th September 2013 as the manga has continued to run in Dengeki Maoh (and Capbon magazine) on a regular basis. The remaining regional warlords (Yoritsuna, Haruhisa and Yoshishige) should be making their mame-style debuts very soon and I'm also curious about whether the bonus chapters from Sengoku Basara Magazine will also be included - it won't be long until I find out!